Sorry, Your Eminence. 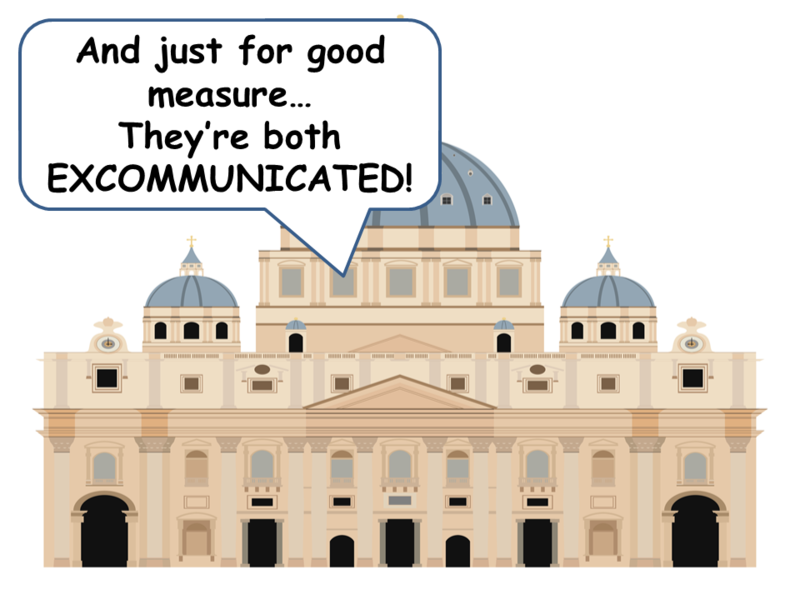 Despite your best efforts to downplay the scandal, excommunication very much remains “a thing! !” It is considered a harsh remedy for the salvation of a soul in desperate danger of damnation, but it is still very much a tool which a caring shepherd can use in a situation like this. Notwithstanding our silly little meme which opens this article, why haven’t our bishops acted to excommunicate notable (and notorious) Catholic politicians who actively support infanticide and abortion? Here are three reasons. You might find Reason #1 hard to take, but please consider it. “Pastoral” is one of those handy post-Vatican II buzzwords that can mean pretty much just about anything the priest, bishop, or trendy theologian using the word wants it to mean. In its most common use, “pastoral” appears to mean “we don’t want to hurt anyone’s feelings.” If you pair this word up with the equally-potent term “mercy,” you have a powerful incantation which permits you remain inactive, even if public figures in your diocese are actively defying Church teachings, committing egregious mortal sins, and encouraging everyone around them to do likewise. “We must show mercy. We must be pastoral.” That’s number one on on our hit parade. Upon further considerations, that really isn’t a reason, so much as it’s an excuse. Mercy is absolutely essential to our salvation, there’s no debating that point. What is conveniently overlooked by so many of our modern theologians, prelates, and celebrity priests is the fact that mercy as a concept is meaningless if it does not remain paired with the concept of justice. A person who sins (that’s all of us) will be subject to the Divine Justice unless they are saved by the Divine Mercy. Mercy manifests itself through the sacrament of Reconciliation: you acknowledge your sins in the confessional, you show true sorrow and perform penance, and you are once more under the protection of Mercy because you’re once more in a state of sanctifying Grace. In His earthly ministry, Jesus showed true pastoral care and mercy towards His lost sheep by living among them, sharing meals with them, and calling them to repentance. When He was dining with publicans and sinners, he wasn’t “accompanying them on their journey.” While he was eating with them, He wasn’t affirming their present lifestyle; he was calling them out of it. And in his preaching, Jesus made it abundantly clear what would happen to their souls if they failed to turn away from sin; if they failed to repent and follow Him. He reminded them of the reality of hell, and of the horrifying consequences of dying in a state of mortal sin. He offered them a way out of this eternal damnation which they had earned, if only they repented and accepted His gift of salvation through the Cross. Now that’s being pastoral! That’s what excommunication does: it points out–in no uncertain terms–the state of danger a person’s soul is in as a result of mortal sin and calls that person to repentance. And not only the person who is the object of this public call to repentance…an excommunication serves as an exhortation for all of us to repent, confess our sins, and to avoid the types of sins which have produced this grave set of circumstances for the public figure who is the object of this harsh remedy. Bishops and cardinals: you want to be pastoral? Then call your people away from sin through whatever means necessary–including excommunication–in order that they may benefit from Christ’s divine Mercy! Reason #2: They don’t want to upset the applecart. These bishops have a pretty good racket going. They’re respected (well, maybe not so much these days), they’re considered pillars of the community, and they perceive themselves as being beloved of their people. If they’re a big-city bishop, they’re probably rubbing elbows with the rich and famous. They’re accepted by the local glitterati, and just might be considered a major celebrity in their own right. They’re like the unpopular kid in school who suddenly finds themselves accepted by and hanging out with all the kids in the highest rung of the social ladder…jocks, cheerleaders…heck, they might even get chosen to have a big role in Homecoming! And, equally important, there are those financial considerations. Dioceses and archdioceses are big money operations. Many of them receive government money to engage in social and charitable work. These are not insignificant sums. Initiating a God-vs.-Caesar type of conflict by excommunicating a very powerful politician could have some very serious financial implications. And that’s unfortunate. The role of a bishop is first and foremost to defend his sheep and do everything they can to help them get to Heaven. When their excellencies and eminences look into the mirror each morning, they’re supposed to see shepherd willing to lay down his life for the sake of his sheep staring back at them. Instead, too many of these men instead see the CEO of a charitable NGO (non-governmental organization) with obligations to “the bottom line”…and that vision informs all their actions. Yes, there are certainly going to be consequences to a public excommunication. Reason #2 means you’re more concerned with the temporal consequences than you are with the eternal ones. Reason #3: Moral cowardice and/or lack of supernatural faith. Lacking the guts to do the right thing and call a Catholic politician who is endangering their own soul (and countless souls around them) to Judgement and everlasting fire…what can that be called other than cowardice? This ties in with Reason #2 to a great extent; something as profound as a public excommunication is going to have consequences. If the fears of earthly retaliation (social, political, economic) are strong enough, the prelate fails to act…even if he knows in his heart he is doing the wrong thing; knows in his heart that souls are in danger but he simply can’t muster the courage to do the hard thing…the right thing. Pray for these men. They are like the Apostles who dearly loved Jesus, but fled in terror from Gethsemane when confronted with the specter of temporal suffering which would arise from remaining at their Savior’s side. They love their Lord, and may yet find their backbones. Pray for them, support them, and encourage them to do the right thing. And the other component of reason number one is a most terrifying theory: what if these men simply don’t believe that it matters? Has their faith been deadened to the point where they really don’t believe in the consequences of personal sin? What if “mercy trumps all” dominates their mind to the point where they completely disregard justice? Have they convinced themselves that there truly is “a reasonable expectation that all people go to heaven,” and–that aside from Hitler and people who throw plastics into the ocean–nobody will merit everlasting punishment? It almost seems as if some of them are acting that way. Pray for these men as well. The Roman Catholic Church has a deficit of cardinals who openly embrace the Magisterium. We need more men like Cardinal Sarah. Instead we have guys like this. Some months before his infamous “rabbit hole” remarks the cardinal in charge of the Chicago Archdiocese still had plenty of other weird things to say. Letting go of “cherished beliefs” like the magisterial teaching of the Church and instead engaging in something like following a path of personal discernment….hmmm…isn’t that what the arch-heritic Martin Luther did? This guy sounds like he’s just another protestant to me.